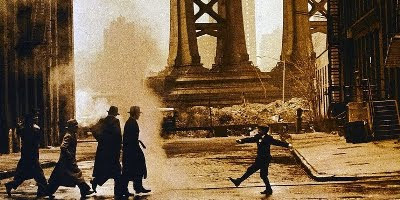 A commercial decision to hack the much debated Once Upon a Time in America to pieces may be a major contributory factor to a number of confusing and ambiguous loose ends although the bookending of the movie with scenes shot in an opium den offer other possible explanations. Either way, far from detracting from the experience, unanswered questions may well prompt repeat viewing as there always remains something more to be discovered. Genre cinema fans should, aside from enjoying the many cinematic delights on offer, be on the lookout for Olga Karlatos of Zombi 2, western regular Mario Brega and a product placement for giallo tipple J and B. Susan Spafford, the English language voice of Julie Wardh and loads of Italian horror films, is credited as a nurse. Child actress Jennifer Connelly impresses, as indeed do all the younger cast members, and would later star in Argento's bonkers thriller Phenomena. Sergio Leone, son of Italian cinema pioneer Roberto Roberti, directs an incredible century spanning crime epic that can rightfully be placed alongside gangster greats such as the Godfather or Goodfellas and Morricone's score is simply magical.